The Scandinavian American Theater Company (SATC) has through its 5 year of existence engaged itself to an array of controversial themes, which question, evaporate, give new perspective, challenge, and perhaps empower the very notion of the ‘Scandinavian’ theater tradition, as it might appear in the world marketplace. The theater company was started by Danish actor Albert Bendix, who after landing in the New York theater scene in 2006, had a vision to establish a collective of theater artists who would represent talent from various Nordic countries. The idea was to bring a Scandinavian perspective to local scene; introducing a new generation of Scandinavian playwrights and theater artists with great ideas and work. In 2014, the company has already proven that the Scandinavian perspective offers both interdisciplinary ideas and multiple voices. The works and approaches create dialogues between current world trends and contemporary artists, and genre tradition and historical themes. The end products are narratives that are empowering. The company does full productions and reading series, which introduce plays, respectively, from different Nordic countries including Sweden, Norway, Finland, Iceland, Denmark, Greenland, and the Faroe Islands. In May 2013, the play Gorilla handled a theme of corporate life, where main characters were entangled with struggle of gender, greed and power. Rhea Leman’s script was directed by Ari Edelson, and produced by the Scandinavian American Theater Company. Gorilla ran three weeks in The Lion Theatre at Theatre Row. In 2012, the company’s Reading Series included an exiting world-premiere of BASTARDS OF STRINDBERG, which introduced four short plays inspired by August Strindberg’s “Miss Julie”. The plays were written by American and Swedish playwrights. The premiere will get a full production in September 2014. Bastards of Strindberg will also open in The Lion Theatre at Theatre Row. The most recent company’s endeavor started their 2014 season of production, on Monday January 27. The reading of a play The Tailor’s Tale (Skraedderens fortaelling) took place at the Scandinavia House in New York City. The play was written by Danish-British filmmaker and writer Alexander Bodin Saphir, and it was directed by Kim Bodnia, also from Denmark. The stage-reading performance was accomplished in English by 8 actors at the Victor Borge Hall of the Scandinavia House. The full house of audiences testified a plot, which was going back 70years in the European history. The play’s theme was based on a story of ‘Rescuing of Danish Jews’ during the WWII. 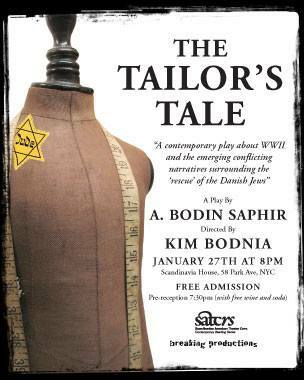 The Tailor’s Tale challenges a commonly told story of the Danish king, who himself was believed to wear a yellow star during the WWII to show the nations support and solidarity towards its Jewish population. This idea in the plot was partially formed around the question of, whether the king really wore the star, or whether it would have happened, if the Danish Jews had to put up a yellow star wearing it, like their other European brothers and sisters. Lars, a character depicting a doubting academic historian, enforces through his own questioning that the story is completely made-up. Contrastively, Isak, a character whose Jewish family survived the war, emphasizes the miracle-side of the story of saving the Jews of Denmark, saying that the miracle is really the only thing that matters. In reality, unlike in most European countries that were occupied by Nazi Germany, the great majority of Jews from Denmark were saved, and brought to Sweden by boats (leaving from many cities), since Sweden remained ‘neutral’ during the War, and was able to take in War refugees. In the play’s narrative, the life-stories of the two, now already aged men go back into the fall of 1943, when the German razzia went into effect in the occupied Copenhagen, Denmark. Isak’s father worked as a Jewish tailor during the war, and the plot goes back to the young boy’s experiences while he was hearing and experiencing the Nazi terror starting to take place in Copenhagen. The plot covers also preparations to escape, as Isak’s father gives him orders to quickly pack, get ready, and alarm other member of the community. Lars, on the other hand, is in the present moment very occupied with existential reasoning. He keeps asking, what really happened in the past, namely 70 years ago. He suffers of inner doubts that concern his own father, who was one of the fisherman with a boat rescuing the Jews. After his own father died in the war, Lars has been seeking the truth about, what were his motives while he helped to save his Jewish neighbors. In today’s meeting, the two old men face unexplained stories, different experiences, doubts, fears and anger of the past. In the plot, Isak and Lars meet at Isak’s house, which he shares with his wife Sara. Lars comes to visit the couple with a new girlfriend Eva, and wants to dig into Isak’s side of the story with her help. He wishes to interview Isak for his book, which handles a theme of the Danes and Danish Jews during the WWII. The playwright Alexander Bodin Saphir told on the January 27th performance in New York City, how the play is very personal to him, as it is based on his grandfather’s Jewish story. Kim Bodnia, play’s director and a cousin to the playwright, described also his personal attachment to his great uncle’s story. Bodnia said that the work-in-progress play benefited greatly from the New York reading and rehearsal experience. The evening was a collaboration of the Scandinavian American Theater Company, Breaking Productions and The American-Scandinavian Foundation.